All you have to do is use the beer of your choice (aided by some butter) as the melting agent for the chocolate. You’ll warm the beer and butter in a small sauce pan, bring them to a gentle simmer, remove them from the heat and then gradually stir in the chocolate. Heating up the beer will get rid of some of its alcohol content. This can be considered a plus if you chose a style with high ABV (very likely for many of the sweeter beers that make good candidates for this recipe) and do not want to taste too much alcohol warmth in your fondue. The butter will add a richness to the fondue and make it extra silky. The short answer is – brews (across styles) that are skewed to the malty side of the equation, with malts in the grain bill that contribute chocolate, espresso, sweet toast and caramel flavors. Generally, you’d want to avoid anything with a pronounced hops presences that will introduce bitterness. So while a dry Irish stout with its bold hoppy character may not impress you, a creamy, sweet milk stout might make you fall in love with your fondue creation. Chris loves browns in general, whether balanced, on the hoppy side or overwhelmingly malty. I seem to gravitate towards the sweeter ones when using them in a recipe (for example this Beer Peanut Brittle) and hoppier ones when I drink them. 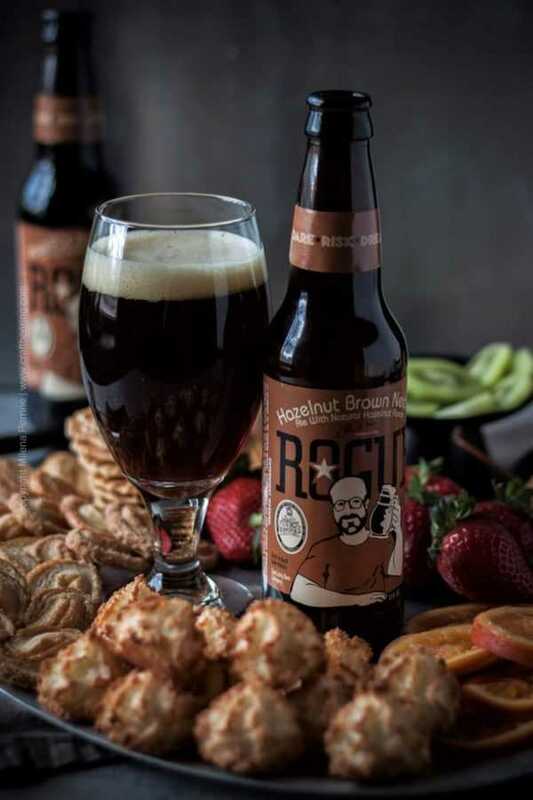 We used the Hazelnut Brown Nectar you see above, brewed by Rogue Ales & Spirits, an independent brewery in Oregon. It is a full bodied, sweet brown ale with chocolate and toasted hazelnut flavors and notable vanilla and cream presence. A really good example of a sweeter brown ale with an ABV 5.6%. Interesting fact – the Rogue Hazelnut Brown Nectar is so popular that it is even available as a home brewing kit which you can buy and create your own batch*. 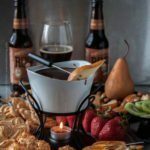 What to Dip in Chocolate Fondue with Ale? You can get creative here, especially in view of the beer style and flavor and the type of chocolate you used in the fondue. Since we had the wonderful toasted hazelnut flavor in our sweet brown ale and we used a combination of milk chocolate and semi-sweet chocolate chips, we included crushed, freshly toasted hazelnuts to use as a crunchy topping over the accompaniments. We bought raw hazelnuts from Oregon (the best!) at Trader Joe’s (gotta love this store, I always say that) and chopped them right before pan toasting them. The smell of those alone was beyond enticing. 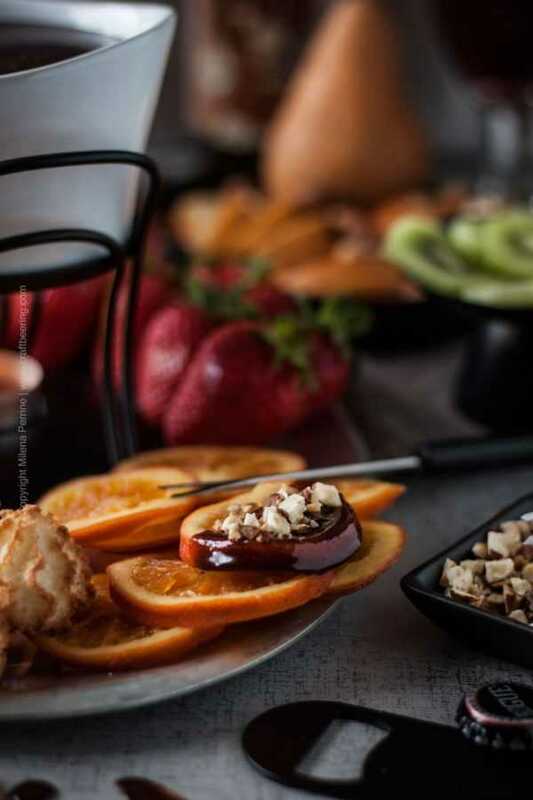 Traditionally, people seem to go for apple slices, banana slices, pineapple and pound cake, and of course strawberries – the most popular choice by far. But I urge you to think what might pair best with the flavors of your beer fondue. If you used a coffee porter and semi-sweet or dark chocolate, wouldn’t it be great to be able to dip some biscotti in it? Or bruleed pears? Or perhaps some macaroons? Roasted grapes? Note: This recipe yields just over 16 oz of fondue, so choose a smaller pot – here is the one we used. 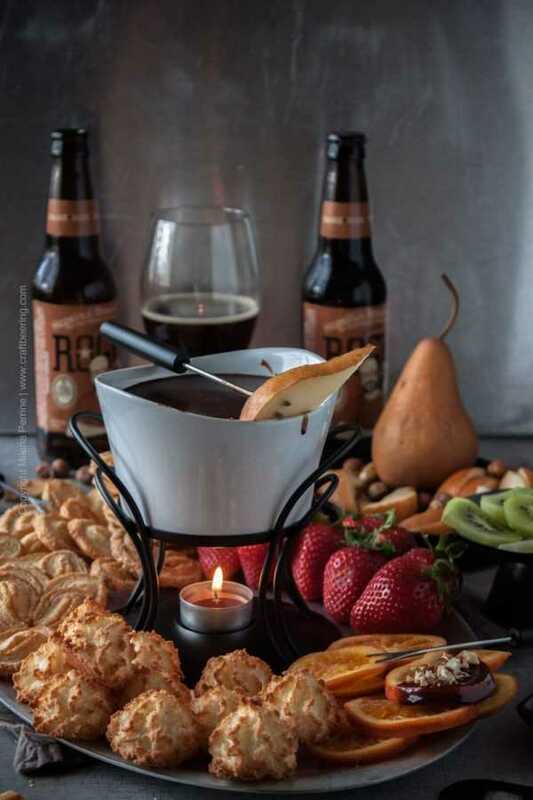 Beer chocolate fondue is not our only vice:) Even though we are not world’s biggest consumers of chocolate, once in a while we love to make a beer chocolate dessert. Check out these easy recipes where the flavors of chocolate are elevated by subtle craft beer interventions. And stay tuned for Chris’ famous (even if only to a few people) raspberry stout chocolate souffles. They are insanely good. *This post contains affiliate links which help support our blog without any cost to you. 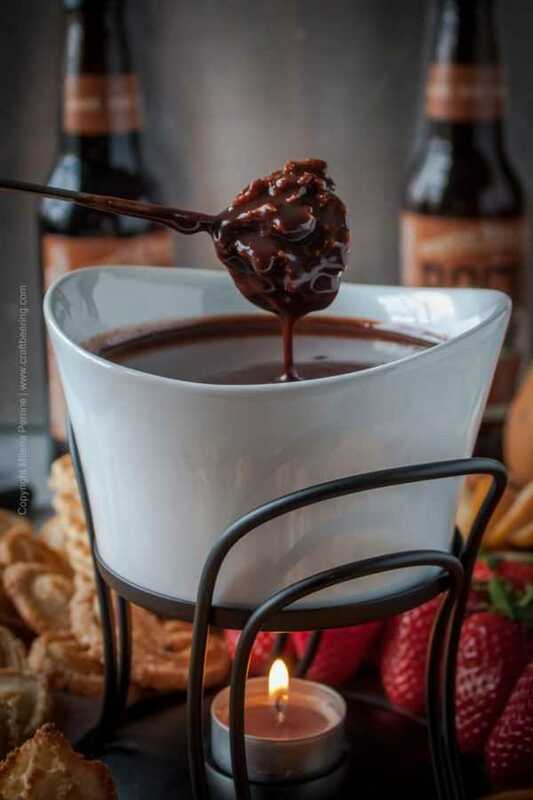 Decadent, rich beer chocolate fondue. You can choose whatever sweeter beer you please to use in this recipe. Could be a milk stout, or a fruit flavored stout, a rich brown ale (we used a hazelnut flavored one), dunkel, porter, dunkelweizen...So many options. In a sauce pan over medium heat bring the beer and butter to simmer. Remove from heat and place sauce pan onto a wooden board or sturdy cooling rack. Slowly add the the chocolate chips/chunks/pieces an stir gently. 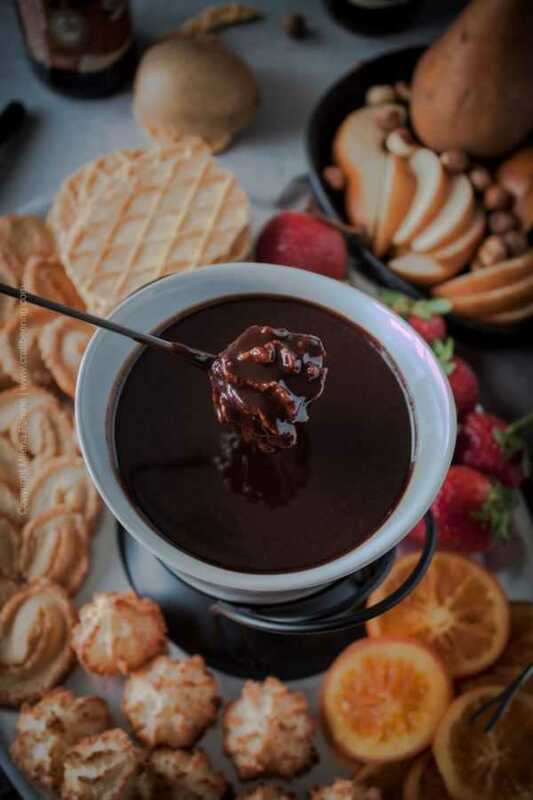 Once all the chocolate has been absorbed and melted, transfer the beer chocolate fondue to a fondue pot with a small burner (such as tea light candle) to keep the chocolate sauce warm. Arrange all the accompaniments around the pot and serve. The recipes you guys put together are seriously amazing! Oh this looks amazing and takes chocolate fondue up a notch! Featuring when my party opens tonight. Pinned to use at my next party -sounds so good! And we love Rogue beers here – we live in Oregon and like to stop at the brewery when we are on the coast! Good choice! Thanks for sharing at the What’s for Dinner party! Your Fondue will be a perfect addition to any Valentine evening! Hope you are having a great day and thanks so much for sharing your awesome post with us at Full Plate Thursday. Holy yumminess. 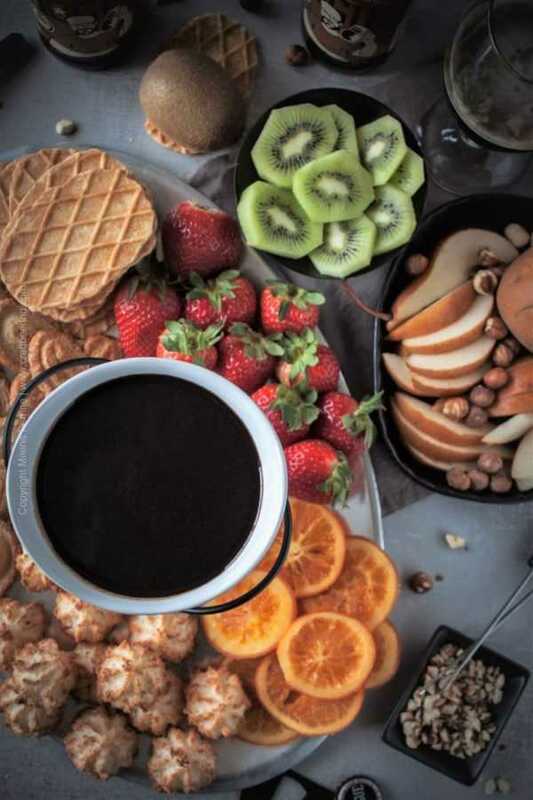 This looks great and I love the treats you are serving with the fondue. Oh, it is a marriage made in heaven! You must try:) And – beer and spicy chocolate is even better! Will post something along those lines soon, promise. You know, I wouldn’t have thought to mix beer with melted chocolate for fear of the chocolate curdling (as it does when it’s introduced to anything with a high water content). But it looks like the butter helps to prevent that. Don’t you just love it when chemistry is so delicious? Thanks so much for sharing at the #happynowlinkup! Oh, wow, oh, wow, oh wow! This would be a decadent treat. Thank you much. Wow! Your images are fantastic! This looks great! This looks delicious. I’d never have thought to mix ale with chocolate. Oh my goodness, if I had that fondue platter in front of me I’d eat it all!! Beer! And chocolate! And all those sweets and fruits to dip! I love how we can customize it to make it an unforgettable experience. That is awesome! I hear you! It’s not easy to resist all the treats when they are placed in front of you, lol. Wow, this recipe looks amazeballs. I haven’t made it to the Rouge Brewery yet but now I know which beer to try when I do! Once again, you delivered an amazing beer inspired recipe, I’m so impressed with your site! Time to blow the dust off the fondue pot! Sounds good! Thank you, Sandra! Friday sounds like a great reason:) Thank you so much, Dawn! It’s my birthday, it’s my birthday!! Saw your picture in my FB beer group. Had stout in the fridge and made for Monday night book club last night. Thank you! I got a LOT of compliments and it tasted delicious. Wow, that’s a really fast response! Glad you enjoyed, Mary! What’s wrong with me that I don’t want to dip anything in that fondue? I just want a straw. . .I’m developing such a love for chocolate and beer together and this seems like the perfect way to indulge :). Hope you’re having a wonderful week!